What, first of all, is the much talked-about ground reaction force (GRF)? The free dictionary defines GRF thus: GRF force is offered by support surface, equaling and opposing force due to body mass passing through the foot to the ground surface.(https://medical-dictionary.thefreedictionary.com/ground+reaction+force). 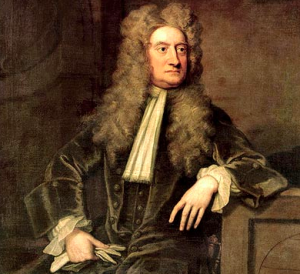 GRF is a spin-off word used mainly by biomechanists to describe one aspect of Sir Isaac Newton’s Third Law of Motion (L-3) – the Law of Action and Reaction. In modern day English, this simply means that when two objects are in contact, they push against one another to an equal extent, whether some movement is the result or not. For instance a person standing on the ground is pushing the ground and the ground is pushing him back, but neither moves. So L-3 is valid even when there is no motion involved. Moreover, it can occur between any two objects, eg. two footballers running into one another or when a person pushes her hand against a wall. GRF is merely the reaction force when the ground is one of the pair of forces acting on one another. Thus, given all the evidence, in simple terms we can state that GRF as measured by force-plates, is a mere reflection of a body’s acceleration, while incorporating the constant factor of its mass/weight. It is known that when a body stands unmoving on a support surface such as the ground, the GRF is equal to the body’s weight (W). If the body then accelerates (which simply stated means it slows down or speeds up), the GRF is no longer equal to W, but more or less than it. Moreover, it is known (from Newton’s second law of motion) that “if the upward push of the ground is equal to the earth's downward attraction (i.e., weight), the net force on the body equals zero and the resulting acceleration is zero. If the ground reaction force is greater than body weight, there is a net positive force acting on the body and the acceleration is positive. Finally, if the ground reaction force is less than body weight, the net force on the body is negative and the acceleration is negative. One book titled Neurobiomechanics of Human Movement (Roger M. Enoka) states that each body segment influences the GRF, based on its mass and its acceleration, and adds that about 50% of a runner’s acceleration is accounted for by his trunk and head, while each leg contributes 17% and each arm 5%. The book incorporates a great example to further illustrate its point. It states that the height achieved in a vertical jump depends upon vertical velocity at takeoff, which in turn depends upon the vertical component of the GRF. The book adds that GRF and acceleration graphs thus always parallel each other in a vertical jump. Putting it all together, GRF is the reaction (or one might perhaps say “interaction”) created by human muscle forces as they push down into the ground, and larger body parts with their larger muscles influence the interaction to a greater extent. So what’s all the fuss about in using GRF to increase club speed in golf? Another way to think of GRF is as a RESISTANCE force. The harder the push down by human muscles and the firmer the surface on which a person stands, the better they can use that surface to create movements off. Three movements in the golf downswing have been recognized as increasing club speed and they all involve ground-golfer interaction. 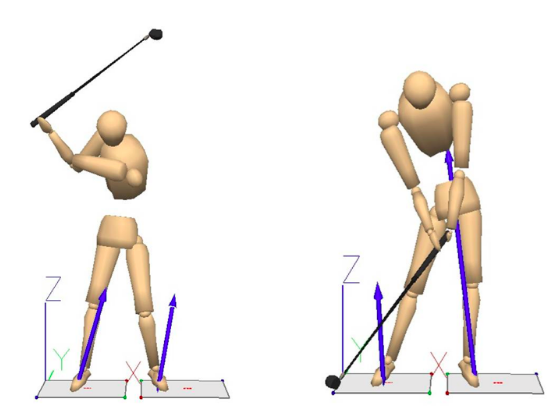 They are “weight shift” towards target, body rotation and trunk elevation. The best way to increase the early build-up of speed is by trying to increase all three of the above. Before we try to analyze how best to do that, it might be a good idea to first of all understand when in the downswing each of them happen and their relative contribution to club speed. Only then should we discuss the best methods to increase those movements. The first movement to take place is weight-shift, a linear move of the body towards target. This movement is useful to give some starting momentum to the body. The second movement is rotation of the torso - pelvis followed by shoulders. The rotation movement uses the forceful contraction of the large muscles of the core to generate torso speed which is eventually passed on through the arms to the club. Finally, late in the downswing, the lift of the lead-side allows the longest possible radius of lead arm and club, for maximum possible linear velocity of the club. No research exists on the amount each of the three movements contributes to eventual club speed! How can the ground be used for each of the “big three” movements? Shear force (an away from target push) through the trail foot moves the body and the center of pressure towards the lead foot. As the golfer pushes the trail foot away from target, “equal and opposite reaction” make the body move towards target, for weight shift. Next, once the center of pressure has moved forward, both feet can be involved in an oppositely-directed force couple to create rotation of the torso. (Read this wonderful paper which reports similar first and second movements in baseball batting: https://www.jospt.org/doi/pdf/10.2519/jospt.1995.22.5.193). Finally, a push-down of the lower limbs will help to accelerate the torso upwards. Watch Alex Noren making practice swings in any 2018 video to understand how people are being trained in order to produce this latter movement. I witnessed Noren actually being trained to do that during the 2018 Genesis Open, and saw him making practice swings with that same move on TV subsequently. All three GRF-using movements are rather misunderstood, in my opinion. Weight shift? A small amount of it is useful in order to get the downswing momentum going. However, to shift “weight” or foot pressure on the ground back a lot, and then to shift it forward again is excessive. It is known that skilled golfers are able to shift body mass forwards by about 12 cm (see this paper: http://www.fitforegolf.com/uploads/3/4/1/4/34149388/lindsay_2008_pro_vs_rec_biomechanical_review.pdf ), while less skilled golfers have neither the muscle strength nor the speed to pull that off. Our goal should be to get some weight shift in the forward swing, without any excessive away-from-target movements during the backswing. How? By starting out with some slight extra pressure on the trail foot - MGS style! What about rotation? While the feet finding firm support on hard ground will offer the muscles adequate purchase to push off of, it is important to know which exact muscles produce the body rotation we golfers need. The main rotators of the body are the large torso muscles – the external and internal obliques. To get these muscles to contract maximally, they need to be stretched during the backswing and then they need a firm foothold to be able to contract forcefully to rotate the trunk. And this is best done by having zero up-and-down or side-to-side movement of the torso at the time the core muscles are contracting most forcefully. Did you know that skilled golfers’ chins do not move targetwards during impact? (see “Hub movement during the swing of elite and novice golfers” by Sanders, R. H., & Owens, P. C. (1992). The MGS, with its pre-swing rotation and subsequent in-swing arms movements stretches the large core muscles, and the stillness of the body the MGS requires helps the powerful abdominal muscles to contract very forcefully while the feet are firmly planted in the ground. Such stillness is an integral part of the MGS. Finally, in order to get their “verticals”, people are actually, these days (a le Alex Noren) being trained to squat-jump, right in the middle of the golf swing. That is problematic because the downswing lasts only 1/3rd of a second. A golfer would have to be very fast and strong to first lower the body and then raise it maximally, all before impact. The fastest, most skilled golfers do it to an extent, but even their lead shoulders are maximally high after impact, indicating that they could not raise the lead side adequately at the moment of impact. The solution? Grab hold of the ground from the beginning of the backswing and let the rise of the body be a natural consequence of the design of the golf swing (depends on the type of golf swing, ofcourse!). BUT this can only work IF there has been no change of body-level in any direction during the backswing. (see pic of maximizing verticals AT and not AFTER impact below). In conclusion, GRF does exist, but is not an active force that can push people hither and yon. It is more of an interaction at the interface of two “objects”. One object, such as the human, should be able to change its quantity of pushing effort, and the other object, such as the ground, should provide passive, inert resistance to sinking through. To utilize it in golf means one should grab hold of the ground before the backswing begins and then not make any movements which reduce the downward push of the feet. No excessive movement side-to-side, no rotation of the trunk during the backswing (finish that before the swing begins!) and no jumping down-and-up during the downswing. That is the best way to utilize the ground and anything else does not maximally allow a person to “hold on”!